Of course that’s not sitting well with the Tea Party and “Christian” right who are screaming about the First Amendment and Robertson’s right to say and believe as he wishes. Freedom of speech is a protection from government intrusion into your right to express yourself. It is not freedom from the consequences of your speech, particularly not when it comes to your employment. When your speech is amplified with fame and celebrity, you should be aware of the consequences. The never recovered from a rockbottom hitting dive (probably induced by huge overdosis of all kinds of brain-mushing drugs) this man is a danger to any organization that holds and maintains values and norms that include everyone, and no one nor anything can be forced to employ dangerous creatures…..
Just an advice, nothing more……..
Was this suppose to be a reality show? The reality is – not everyone believes gays and lesbians should be embraced. 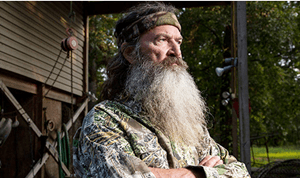 Duck Dynasty told A&E they would not compromise their beliefs and values just for the glitz of a show. A&E agreed & signed them on. Dynasty stars speak how they truly think and feel. Too bad everyone can’t do that. It’s not about religion, freedom of speech or anything else. It is about being honest and true to self. They do not lie and put on false faces which is what society has come to demand. That is most sad. If you don’t like whats on TV, you have the freedom to change it. If you feel your environment treats you offensively – move! Their whole act is a lie.